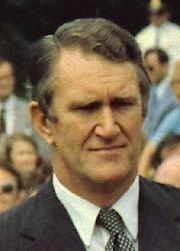 John Malcolm Fraser, AC, CH, PC (May 21, 1930 - March 20, 2015) was an Australian politician who was the 22nd Prime Minister of Australia. He came to power in the 1975 election following the dismissal of the Whitlam Labor government, in which he played a key role. Similar to its immediate predecessor, the term of the Fraser Coalition government was one of the most controversial periods in Australian political history. After three election victories, he was defeated by Bob Hawke, the Labor leader in 1983, which ended his career and left him alienated from his own party. During his political career, Fraser represented a more conservative, and in some respects, colonial view of Australia and of Australian identity that still looked to Great Britain, despite independence, as a model. This view was opposed by the Labor party for whom Australia now needed to make its own way in the world and, at least in part, to reposition its self in the Asian context. 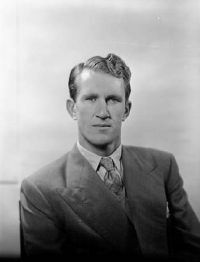 In contrast to Bob Hawke, Fraser was a patrician of old settler stock who was privately educated at one of Australia's most prestigious schools followed by the University of Oxford, while Hawke attended the local state school, an Australian University then won a Rhodes Scholarship to Oxford. Fraser's grandfather had served as a Senator to the Australian government. Fraser's policies can be understood as straddling the old and the new. He opposed deregulations of the economy, which hindered the process of opening Australia up for trade in the pacific rim and ended the medical health care provisions that the Whitlam government had established. On the other hand, Fraser was open to giving sanctuary to refugees and made some reforms in Aboriginal land rights. 3 Role in "the dismissal"
Critics describe his years as Prime Minister in terms of missed opportunities. Perhaps, since he won the 1975 election with a landslide, Australians were not yet ready to embrace an identity that cut them free, in many respects, from the old order and moved them towards a new one. Post-Fraser, both Liberal and Labor governments have stressed Australia's role as a cultural (and democratic) bridge within the region, recognized by President Hu Jintao of China. Born in Toorak, he had a Jewish maternal grandfather, of whose ethnicity Fraser claims never to have been mindful. The Frasers have had a long history in politics. His grandfather, Simon Fraser, had served in the Victorian parliament and later in the Australian Senate. The Fraser family lived at Balpool-Nyang near Wakool until 1943 when Neville Fraser, Malcom Fraser's father, sold the property and bought Nareen in western Victoria. Malcom Fraser retained a strong attachment to Balpool-Nyang, later writing: "Droughts made us sell out but forever will the memory of Nyang be strong within me. Nareen will never quite take its place." Fraser contested the seat of Wannon, in Victoria's Western District, in 1954 for the Liberal Party, losing by 17 votes. The following year, however, he won the seat with a majority of more than five thousand, becoming the youngest member of the House of Representatives, and continued to represent Wannon until his retirement. In 1956, he married Tamara "Tamie" Beggs (born February 28, 1936), a grazier's daughter. The couple had four children. Tamie Fraser professed to have no interest in politics. Fraser developed an early reputation as a right-winger, and he had a long wait for ministerial preferment. He was finally appointed Minister for the Army by Harold Holt in 1966, in which he presided over the controversial Vietnam war conscription. Under John Gorton he became Minister for Education and Science, and in 1968 he was made Minister for Defense: A challenging post at the height of Australia's involvement in the Vietnam War and the protests against it. In March 1971, Fraser resigned abruptly in protest at what he said was Gorton's interference in his ministerial responsibilities. This led to the downfall of Gorton and his replacement by William McMahon. Under McMahon, Fraser once again became Minister for Education and Science. When the Liberals were defeated at the 1972 election by the Labor Party under Gough Whitlam, he became a member of the opposition front bench under Billy Snedden's leadership. Fraser responded to Snedden's defeat at the 1974 election by successfully challenging for the opposition leadership. In 1975, in the context of a series of ministerial scandals that were rocking the Whitlam government, Fraser opted to use the Coalition opposition Senate numbers to delay the government's budget bills with the objective of achieving an early election (Australian constitutional crisis of 1975). After several months of deadlock, during which the government secretly explored methods of obtaining supply funding outside the Parliament, Governor-General Sir John Kerr intervened and revoked Whitlam’s commission on November 11, 1975. Fraser was immediately sworn in as caretaker prime minister under a strict stipulation to give the Governor-General immediate advice to issue writs for an election of both Houses. Malcom Fraser's role in "the dismissal" remains one of the most passionately-debated subjects in Australian political history. The Liberal-Country Party coalition won a landslide victory with the support of media, notably the Murdoch press, which had previously supported the ALP. The Coalition won a second term nearly as easily in 1977. The Liberal Party won a majority in their own right in both elections; there being no need to have a formal coalition with the Country Party, there was considerable speculation that the Liberals would govern alone, however the coalition was retained. Fraser quickly dismantled some of the programs of the Labor government, such as the Ministry for the Media, and he made major changes to the universal health insurance system Medibank. He initially maintained Whitlam's real level of tax and spending, but real per-person tax and spending soon began to increase. He did manage to rein-in inflation, which had soared under Whitlam. Although his so-called "Razor Gang" implemented stringent budget cuts across many areas of the Commonwealth Public Sector, including the ABC, the Fraser government did not carry out the radically conservative program that his political enemies had predicted, and that some of his followers wanted. He in fact proved surprisingly moderate in office, to the frustration of his Treasurer, John Howard and other pro-Thatcherite ministers, who were strong adherents of monetarism. Fraser's economic record was marred by rising unemployment, which reached record levels under his administration, caused in part by the ongoing effects of the global oil crisis that had begun in 1973. Fraser was active in foreign policy. He supported the Commonwealth in campaigning to abolish apartheid in South Africa, and refused permission for the aircraft carrying the Springbok rugby team to refuel on Australian territory en route to their controversial 1981 tour of New Zealand. Fraser opposed white minority rule in Rhodesia. During the 1979 Commonwealth Conference, Fraser, together with his Nigerian counterpart, convinced newly-elected British PM Margaret Thatcher to withhold recognition of the internal settlement Zimbabwe Rhodesia government (Thatcher had earlier promised to recognize it). Subsequently, the Lancaster House talks were held and Robert Mugabe was elected leader of an independent Zimbabwe in 1980. A former deputy secretary of the Department of Foreign Affairs and Trade has stated that Fraser was "the principal architect" in the installation of Robert Mugabe. Tanzanian president Julius Nyerere said he considered Fraser's role "crucial in many parts," and Zambian president Kenneth Kaunda called it "vital." Under his government, Australia also recognized Indonesia's annexation of East Timor, although many East Timorese refugees were granted asylum in Australia. Fraser was a strong supporter of the United States and supported the boycott of the 1980 Summer Olympics in Moscow. But, although he persuaded some sporting bodies not to compete, Fraser did not try to the prevent the Australian Olympic Committee sending a team to the Moscow games. In immigration policy, Fraser also surprised his critics. According to 1977 cabinet documents, the Fraser government adopted a formal policy for "a humanitarian commitment to admit refugees for resettlement." Fraser expanded immigration from Asian countries and allowed more refugees to enter Australia. He supported multiculturalism and established a government-funded multilingual radio and television network, the Special Broadcasting Service (SBS), a Whitlam initiative. Despite his support for SBS, the Fraser government imposed stringent budget cuts on the national broadcaster, the ABC, which came under repeated attack from the Coalition for its supposed left-wing bias and for allegedly "unfair" or critical coverage on TV programs including This Day Tonight and Four Corners, and on the ABC's new youth-oriented radio station Double Jay (2JJ). One of the results of the cuts was the plan to establish a national youth radio network—in which Double Jay was the first station—was delayed for many years, and did not come to fruition until the 1990s. Fraser also legislated to give Indigenous Australians control of their traditional lands in the Northern Territory, but would not impose land rights laws on the conservative governments in the states. At the 1980 election, Fraser saw his majority sharply reduced and his coalition lost control of the Senate. Fraser was convinced, however, that he had the measure of the Labor leader, Bill Hayden. But in 1982 the economy experienced a sharp recession; and also a protracted scandal over tax-avoidance schemes run by prominent Liberals plagued the government. A popular minister, Andrew Peacock, resigned from Cabinet and challenged Fraser's leadership. Although Fraser won, these events left him politically weakened. By the end of 1982, it was becoming likely that the popular former trade union leader Bob Hawke was going to replace Hayden as Labor leader. Fraser wanted to call a snap election to defeat Hayden before Hawke could replace him, but he was prevented by the tax-evasion scandal and by the onset of ill-health. When Fraser acted, he had left his run too late. On the day Fraser called the election for March 5, Hawke replaced Hayden as leader of the ALP and Leader of the Opposition. Fraser was soundly defeated by Hawke in the 1983 election. He was the only Prime Minister whose term was marked by double dissolutions at both the beginning and the end. Fraser immediately resigned from Parliament. Over the thirteen years that the Liberals then spent in opposition until 1996, they tended to blame the "wasted opportunities" of the Fraser years for their problems, and Fraser distanced himself from his old party. The Hawke Government supported his unsuccessful bid to become Secretary-General of the Commonwealth of Nations. In retirement Fraser served as Chairman of the United Nations Panel of Eminent Persons on the Role of Transnational Corporations in South Africa 1985, as Co-Chairman of the Commonwealth Group of Eminent Persons on South Africa in 1985-86, and as Chairman of the UN Secretary-General's Expert Group on African Commodity Issues in 1989-90. Fraser became president of the foreign aid group Care International in 1991, and worked with a number of other charitable organizations. In 2006, he was appointed Professorial Fellow at the Asia Pacific Centre for Military Law, and in October 2007, he presented his inaugural professorial lecture, Finding Security in Terrorism’s Shadow: The importance of the rule of law. On October 14, 1986, Fraser, then the Chairman of the Commonwealth Eminent Persons Group, was found in the foyer of the Admiral Benbow Inn, a seedy Memphis hotel wearing nothing but a towel and confused as to where his trousers were. The hotel was an establishment popular with prostitutes and drug dealers. Though it was rumored at the time that the former Prime Minister had been with a prostitute, his wife believed it more likely that he was the victim of a practical joke by his fellow delegates. Fraser himself refused to comment on the matter. 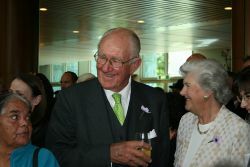 Malcolm Fraser at Parliament House for the national apology to the Stolen Generations in February 2008, initiated by the Rudd Labor government. After 1996, Fraser was critical of the Howard Liberal government over foreign policy issues (particularly support for the foreign policy of the Bush administration, which Fraser saw as damaging Australian relationships in Asia). He opposed Howard's policy on asylum-seekers, campaigned in support of an Australian Republic and attacked the political integrity of Australian politics alongside former Labor Prime Minister Gough Whitlam, finding much common ground with his predecessor. The 2001 election completed Fraser's estrangement from the Liberal Party. Many Liberals became unrestrained in their attacks on the Fraser years as "a decade of lost opportunity," on deregulation of the Australian economy and other issues. This was highlighted when, in early 2004, a Young Liberal convention in Hobart called for Fraser's life-membership of the Liberal Party to be ended. As Fraser passed 70, he had lost none of his combativeness and generally gave as good as he got in these exchanges. In 2006, Fraser launched a "scathing attack" on the current Howard Liberal government, attacking their policies on areas such as refugees, terrorism and civil liberties, and that "if Australia continues to follow United States policies it runs the risk of being embroiled in the conflict in Iraq for decades and a fear of Islam in the Australian community will take years to eradicate." Mr. Fraser also said the way the Government handled the David Hicks, Cornelia Rau and Vivian Alvarez Solon cases, was questionable. On July 20, 2007, Fraser sent an open letter to the 187787 members of Australian independent community advocacy organization GetUp! encouraging members to support GetUp's campaign for a change in policy on Iraq including a clearly defined exit strategy. Mr. Fraser stated: "One of the things we should say to the Americans, quite simply, is that if the United States is not prepared to involve itself in high level diplomacy concerning Iraq and other Middle East questions, our forces will be withdrawn before Christmas." In December 2007, after defeat of the Howard government at the 2007 federal election, Mr. Fraser claims Mr. Howard approached him in a corridor following a cabinet meeting in May 1977, regarding Vietnamese refugees, and said: "We don't want too many of these people. We're doing this just for show, aren't we?" The claims were made by Mr. Fraser in an interview to mark the release of the 1977 cabinet papers. Although Mr. Howard, through a spokesman, says he did not recall any conversation with Mr. Fraser on the issue, he at the same time denied making the comment. In January 2008, Liberal MP Sophie Mirabella launched an attack on Fraser, after a speech he gave at Melbourne University on "the Bush Administration (reversing) 60 years of progress in establishing a law-based international system," claiming errors and "either intellectual sloppiness or deliberate dishonesty," and that he tacitly supports Islamic fundamentalism, should have no influence on foreign policy, and that his stance on the war on terror has left him open to caricature as a "frothing-at-the-mouth leftie." In 2012, Fraser criticized the basing of US military forces in Australia. In 2014, speaking on the Russian RT television network, he criticized the concept of American exceptionalism and US foreign policy. In late 2012, Fraser wrote a foreword for the journal Jurisprudence where he openly criticized the current state of human rights in Australia and the Western World. "It is a sobering thought that in recent times, freedoms hard won through centuries of struggle, in the United Kingdom and elsewhere have been whittled away. In Australia alone we have laws that allow the secret detention of the innocent. We have had a vast expansion of the power of intelligence agencies. In many cases the onus of proof has been reversed and the justice that once prevailed has been gravely diminished." During his retirement Fraser published his memoir, Malcolm Fraser: The Political Memoirs (with Margaret Simons – The Miegunyah Press, 2010), and Dangerous Allies (Melbourne University Press, 2014), which warns of "strategic dependence" on the United States. Malcolm Fraser died on March 2015, after a brief illness. An obituary noted that there had been "greater appreciation of the constructive and positive nature of his post-prime ministerial contribution" as his retirement years progressed. Fraser was given a state funeral at Scots' Church in Melbourne on March 27, 2015. His ashes are interred within the 'Prime Ministers Garden' of Melbourne General Cemetery. Evaluations of Fraser's prime ministership have been mixed. He is generally credited with restoring stability to the country after a series of short-term leaders, but some have seen his government as a lost opportunity for economic reform. 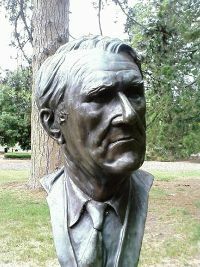 In 2004, Malcolm Fraser designated the University of Melbourne in Australia the official custodian of his personal papers and library to create the Malcolm Fraser Collection at the University of Melbourne. Upon his death, Fraser's 1983 nemesis and often bitter opponent Hawke fondly described him as a "very significant figure in the history of Australian politics" who, in his post-Prime Ministerial years, "became an outstanding figure in the advancement of human rights issues in all respects", praised him for being "extraordinarily generous and welcoming to refugees from Indochina" and concluded that Fraser had "moved so far to the left he was almost out of sight". In June 2018, he was honored with the naming of the Australian Electoral Division of Fraser in the inner north-western suburbs of Melbourne. Fraser was made a Privy Councilor in 1976, a Companion of Honour in 1977 and a Companion of the Order of Australia in 1988. In 2000, he was awarded the Human Rights Medal. He received the Grand Cordon of the Order of the Rising Sun from the Emperor of Japan in 2006. He was awarded honorary doctorates from Deakin University, Murdoch University, and the University of South Carolina, the University of Technology, Sydney, and New South Wales University. ↑ Hamish McDonald, Hu Embraces Australia as Cultural Bridge Sydney Morning Herald, October 18, 2003. Retrieved September 19, 2018. ↑ Australian Biography, Malcom Fraser: Full Interview Transcript (part 10) April 14, 1994. Retrieved September 19, 2018. ↑ Malcom Fraser and Margaret Simons, Malcolm Fraser: The Political Memoirs (Melbourne University Publishing, 2015, ISBN 978-0522868876). ↑ John Kerr, Matters for Judgment (South Melbourne, AU: MacMillan, 1978, ISBN 978-0333252123). ↑ When talk of racism is just not cricket Sydney Morning Herald, December 16, 2005. Retrieved September 19, 2018. ↑ Hal Golebatch, You got him in, so help kick him out The Australian, April 16, 2008. Retrieved September 19, 2018. ↑ 7.0 7.1 Mike Steketee, Howard in war refugee snub: Fraser, The Australian, December 31, 2007. Retrieved September 19, 2018. ↑ Malcom Fraser, Finding Security in Terrorism’s Shadow: The importance of the rule of law The University of Melbourne, October 25, 2007. Retrieved September 19, 2018. ↑ Emily Crane, The night Malcolm Fraser lost his trousers in a seedy Memphis hotel The Daily Mail, March 20, 2015. Retrieved September 19, 2018. ↑ Fraser urges Iraq policy rethink. ABC, November 27, 2006. Retrieved September 19, 2018. ↑ Michelle Grattan, Fraser call to pressure US on Iraq The Age, July 20, 2007. Retrieved September 19, 2018. ↑ Reid Sexton, Liberal MP attacks 'frothing' Fraser The Age, January 6, 2008. September 19, 2018. ↑ Malcolm FraserWhy Gillard's uranium-to-India policy is dangerously wrong Sydney Morning Herald, December 12, 2011. Retrieved September 19, 2018. ↑ Gidget Fuentes, A flap grows Down Under over new USMC rotations Marine Times, April 23, 2012. Retrieved September 19, 2018. ↑ https://www.breitbart.com/video/2014/03/18/Former-Australian-PM-Attacks-America-thinks-its-superior-rules-only-apply-to-inferior-nations/ Former Australian PM Attacks America: Thinks its superior rules only apply to inferior nations] Breitbart, March 18, 2014. Retrieved September 19, 2018. ↑ Malcolm Fraser, "Forward" The Journal Jurisprudence 15, September 1, 2012. (The Elias Clark group, 2012, ISBN 978-0980522488). ↑ Malcolm Fraser endorses Sarah Hanson-Young in TV ad The Sydney Morning Herald, July 28, 2013. Retrieved September 19, 2018. ↑ Book review: Dangerous Allies by Malcolm Fraser The Conversation, May 30, 2014. Retrieved September 19, 2018. ↑ Latika Bourke, Former prime minister Malcolm Fraser dead at 84 Sydney Morning Herald, March 20, 2015. Retrieved September 19, 2018. ↑ Peter Lloyd, Malcolm Fraser: Australia's 22nd prime minister dies aged 84 ABC News, March 20, 2015. Retrieved September 19, 2018. ↑ John Farquharson, A towering figure who crossed the political divide Sydney Morning Herald, March 20, 2015. Retrieved September 19, 2018. ↑ Former prime minister Malcolm Fraser farewelled at state funeral in Scots' Church in Melbourne ABC News, March 27, 2015. Retrieved September 19, 2018. ↑ About The Malcolm Fraser Collection The University of Melbourne. Retrieved September 19, 2018. ↑ Robert Hawke, Bob Hawke on Malcolm Fraser SkyNewsAustralia, March 19, 2015. Retrieved September 19, 2018. ↑ Proposed redistribution of Victoria into electoral divisions Report of the Redistribution Committee for Victoria, April 2018. Retrieved September 19, 2018. Ayres, Philip, and Valéry Giscard d'Estaing. Malcolm Fraser: A Biography. Richmond, AU: W. Heinemann, 1987. ISBN 978-0855610609. Curran, James, Malcolm Fraser, Bob Hawke, John Howard, Paul Keating, and Gough Whitlam. The Power of Speech: Australian Prime Ministers Defining the National Image. Carlton, AU: Melbourne University Press, 2004. ISBN 978-0522850987. Edwards, John. Life Wasn't Meant to be Easy: A Political Profile of Malcolm Fraser. Sydney, AU: Mayhem, 1977. ISBN 978-0908094028. 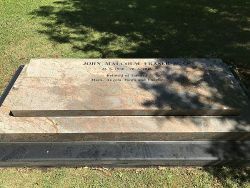 Fraser, John Malcolm, D.M. White, and David Alistair Kemp. Malcolm Fraser on Australia. Melbourne, AU: Hill of Content, 1986. ISBN 978-0855721596. Kelly, Paul. "Malcolm Fraser." In Michelle Grattan (ed.). Australian Prime Ministers. Frenchs Forrest, UA: New Holland, 2000. ISBN 978-1864366716. Kelly, Paul. November 1975: The Inside Story of Australia's Greatest Political Crisis. St Leonards, AU: Allen & Unwin, 1995. ISBN 978-1863739870. Renouf, Alan. Malcolm Fraser and Australian Foreign Policy. Sydney, AU: Australian Professional Publications, 1986. ISBN 978-0949416032. Schneider, Russell. War Without Blood: Malcolm Fraser in Power. London: Angus & Robertson, 1980. ISBN 978-0207141966. Weller, Patrick Moray. Malcolm Fraser, PM: A Study in Prime Ministerial Power. Ringwood, AU: Penguin Books, 1989. ISBN 978-0140129748. All links retrieved August 8, 2018. Australian Biography – Malcolm Fraser An extensive 1994 interview with Fraser. Malcolm Fraser at the National Film and Sound Archive. Video of Malcolm Fraser and Gough Whitlam in their pro-republic commercial. How to revive a party that seems to be stuck in opposition: Malcolm Fraser – The Age 11/02/2008. Balanced policy the only way to peace: Malcolm Fraser The Age 10/05/2008. This page was last modified on 19 September 2018, at 21:39.